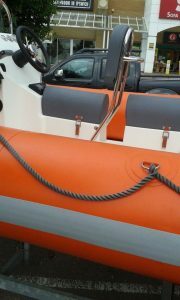 Custom Yacht and Boat Upholstery Services and Supplies for over 35 Years. For over 35 years R&M Custom Yacht and Boat Upholstery has been providing the highest quality bespoke marine upholstery services for all kinds of vessels throughout East Anglia and beyond. From custom upholstery for small craft to complete interior refurbishments for larger yachts and cabin cruisers we have the experience and know how to produce the finest marine grade furnishings for your pride and joy that are built to last. Every piece of custom marine upholstery we produce is made in house at our premises in Kesgrave from the finest British made materials. All our marine grade furnishings are made by time served Master Craftsmen and each piece is lovingly crafted by hand so you can be assured of a top quality service. We stock and can source a large range of marine grade fabrics and materials and we also supply a range of vinyls, pvc, cloths, sailcloth’s and various types of foams to suit any vessel or budget. We aim to provide a courteous and efficient service with the utmost professionalism. Whether you have a rowing boat, a small or large yacht, a rib or dinghy, riverboat or narrow boat, a speedboat, inflatable or pleasure craft, a fishing boat or you provide rental craft or cabin cruisers, such as those travelling The Broads, we can assure you we have the skills and knowledge built up over many years by our experienced team to satisfy the requirements you have for your vessel’s interior refurbishment or custom one off designs.